The contest closed Mar 30, 2016. The voting closed Apr 18, 2016. Due to the rise of a critically urgent issue concerning refugees in the Arab world, communities needs to come together to address the humanitarian crisis. 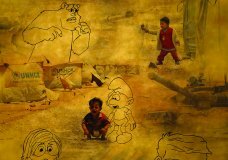 As a way of showing support and encouraging solidarity we invite you to share your stories from Syria through creative artwork (Images or videos). These visual representations will not only be an opportunity to share stories with thousands of people around the world, but will also help inspire action from individuals, organizations, and policy-makers. Images that reflect the current circumstances and crises that Syrian people and/or refugees are facing wherever they are. Our aim is to increase the awareness of the refugee crisis in the international community as well as document the beautiful memories that we would like to share and remember together. Our plan is to curate an online collection that will be showcased at different events and exhibitions. With that in mind, please include a text description of up to 500 words with the image or video that you submit. This artistic collaboration is part of the Touq Al Yasmin initiative that launched in 2016 with the support of TakingITGlobal and aims at raising global awareness of the current situation of Syrian refugees around the world as well as organizing different activities to support refugees. Promote this contest to your networks with the Stories From Syria Poster. While the contest is open to everyone, contest winners must be between 13-35 years old at the time of entry. *Please note: 10% of each prize will be donated to an organization of the winners choice supporting Syrian Refugees. A list of suitable organizations will be provided to winners when selected. Prize winners must be 13-35 years old.